Here are a few common answers to questions most people ask about Magic Sculp. Working time depends on the temperature of the room you are working in while using magic sculp. Most often you should have a couple of hours or more working time. I have worked with it longer in the winter and shorter in the summer. So there is really no real set time period. Shelf life- NEW IMPROVED FORMULA, Non Crystallizing Resin. Stays Soft and ready to use. Should last a life time. There is only one way to mix Magic Sculp properly. Please double click mixing instructions. Q Does magic sculp stick to plastics like styrene or others? A Yes, but without proper bonding, it will break off. Prior to applying MS to any plastic, I recommend that you prepare the plastic with a thin coat of an appropriate glue, i.e. plastic cement for model kits, PVC glue for PVC, acrylic glue for acrylic plastic. his has the effect of breaking up the molecules of plastic and allowing the MS to bond at the molecular level. It's really quite effective. You may also drill some "capture" holes for the MS to grab onto. Q HI need to sculpt 6 foot sculptures that will be kept outdoors in Connecticut all year long for decades (church site). The environment would include snow and rain and temperatures as low as 10 degrees and as high as 100 degrees. Is Magic Sculp suitable for these types of conditions? A Protect it from UV light by painting it. Cold will make all things brittle so make it thick. If it will be touch by people. QPlease verify that this is an air dry product. A No, it is not. It is a chemical cure that occurs under water, dirt, in a vacuum...wherever. Q For example, if I scuplt the head first and let it dry and return to it a month later to add the neck and shoulders, will the two sections bond? Can I let the head dry and a month later return to build up cheek bones, eyebrows, etc. without concerns over bonding with the old and new pieces? A But, you can add successive layers by preparing the first layer with a set of capture holes....gives subsequent layers something to grab onto. Cured layers are insoluble. Q Hi just got a coldcast porcelain statue of Satan and Satanika and she has some cracking right over her right hip. Wanted to know best way to repair. Just wet sand it down and paint or should I use magicsculpt and then just paint that? A Epoxy is a polymer and will brake down by UV Light. of trouble with mixing. . Any suggestions? A Please read the mixing instructions. Your hands will warm it and it will become more pliable Mix by volume not wt. Mix well. Water will smooth it but it will not thin it. Magic Sculp will harden under water. A Yes, perfectly safe. I would give it a few days to harden just to be on the safe side. sculp? If so how much should be used? A Should work ok depending on compatibility. You will have to experiment with ratios, however, to find the best mix. There are no formulas that I am aware of. Q My main question is, How durable is MS? hasn't been tried, not with MS anyway..
epoxy putty (about $5 per 2 pounds) per hoof. around a shoe or boot and then molding the MS around it. Before I go any further, let me describe the situation for these hoof-shoes. mistake or somesuch. I would also like some suggestions, if you have any. Q Can I make candle molds out of magic sculpt? You can make any kind of mold you choose from MS. 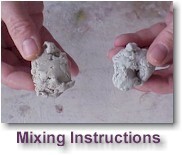 If it is a two part mold, use talc as a release agent to ensure proper separation during the fabrication of the mold! A There was a time when I wanted to wet sand uncured MS. I used 80 grit wet to sand gobs of MS that I was using to fill the gaps in some large resin castings. It worked well and the MS cured properly. My point is that you may be able to thin MS to a consistency that may pass through a cookie press. Your second option is to "scree" the MS into the desired shape. Screeing is an Old World technique used to shape plaster. Cut a section of thin metal (plexiglass works well, too) plate to a size that will fit comfortably in your hand. Cut or file the desired profile into the scree ensuring that the cutting edge is very sharp and smooth. Lay in an over-sized rope of MS. Press it into place following the outline you wish to represent. Then, wet the MS and the scree. Start pulling the scree over the MS, carefully at first, then with more bite as the MS assumes the shape you want. If you gouge the MS, put a repair patch in place and re-scree. Jinx- Sounds like the wet might work well to my hoping, the scree may not I'm afraid since I'm working on 1/12th or doll scale and the lacework is very very tiny. Up till this point I've been using puff paint through a size 18 steel decorating dip . trying to get it down to a size 20 (These being wire sizes). As you can imagine, it's very tedious work, but when it does work it makes some fantastic lace work and then I puff it to give it some consistency and peel it from the work sheet.... with clay I could get it even thinner and shape it into a more substantial form... here's hoping! Will let you know how it turns out! thanks for the suggestion! Q Will it adhere to a smooth, painted, plastic surface? Or will I have to roughen the surface with sand paper first? Q I'm an auto modeler, and am scratchbuilding much of a Ferrari 250 GTO. then use that negative with MS to create a positive. Will I have problems with the MS sticking to the MS? Would the talcum work in a case like this? A I am always encouraging modelers to use and purchase MS. But, in this case, I am wondering why you want to create an "internegative." If you are producing multiple dashes, I can understand your intentions, but if it's a one-of dash, why go through the trouble? In either event, talc will work as the release agent. You will need to exercise caution as you press your master into the MS. MS wants to stick to the plastic. I would suggest that you wet your master and make successive presses, a little at a time, until you achieve your full depth. Additionally, you will need to pack the master with a firm material such as a block of balsa to prevent the master from flexing as you press it into the MS.
Q What do you recommend to strip a pre-painted resin kit? A I use Aircraft Paint Remover brand or, recently, Dad's Easy Spray paint and varnish remover. I purchased the latter in the hardware/paint section at WalMart for a few bucks. It comes with a squeeze sprayer and works like a champ. This is not one of those ill-working "earth-friendly" types. This stuff is acid. You must wear rubber gloves and work in a well-ventilated area. AI understand some people are more sensitive than others. If you are using those protective devices with A&B, I would recommend you continue with MS.
Q I am a One-of-a-kind doll artist and use polymer clays. I sculpted a huge snail about the size of a basketball over a tinfoil armature. I will have a Mermaid sitting on a section of the snail that I allowed to house a "guilded" throne. I want to use magic sculpt to make the throne. After I lay the wire form for the throne can I apply magic sculpt without drilling into the cured polymer clay for a foundation? Another words, can I apply the magic sculpt directly to the polymer clay ? and will it adhere to the clay without seperation? Also, if by chance I want to add some more clay to this particular sculpt, once the MS has dried, can it go back into the oven at 265 degrees? Thanks for your help. I have never used MS before but want to start incorporating it into my sculpts using polymer clays. etc) might it be found? rough side, but could be used as a sort of advanced armature. A You have me on the talcum powder. You probably should try using pure talc, which can be ordered from a pharmacy. A I would definitely not recommend firing MS since I have never tried subjecting it to 1200 degree temperatures. I know it survives an oven though. It is air cured, so no need to heat. You will find MS bonds well to the clay and Plasticene. Make no attempt to smooth either the clay or Plas. MS needs something to grip. Now, if you put MS over the unfired white clay, you may have a problem keeping the clay stable. MS is not as pliable as clay. You may distort the clay. Why not just us MS instead of clay? That's what I do. Instead of clay, you can also use Super Sculpey. The only reason clay is being used is because it is a "traditional" material that has the advantage of being incredibly cheap. But any serious sculptor is using advanced materials. You have the advantage of current technological information. Why not use it? Q Is Magic Sculpt reversible? A If you mean, how can one remove cured MS, you can not. It is cured and must be chipped away. Q With what product can one dissolve the cured Magic Sculpt? A While in its uncured state, water works ever so well. Otherwise, you must use a grinding tool. Q Does MS adhere to porcelain - without drilling holes? Once thouroughly cured, can it withstand temperatures of 325 degrees? Does it have a reaction/interaction with thermohardening pigments? A I'm not certain about the temperature ( not recommended for over 300 by Dean)., but I have put magic sculp in a domestic oven at 120Centigrade. I usually mix the product with titanium dioxide, as most repairs need that colour as a base, although now I find I am mixing all colours of artists powder pigment to get the final colour. It may need some touching up with a coloured glaze: here in the UK we use Rustins Plastic Coating, which can be baked at 120centrigrade, or with the use of a catylist, can be cold set. That can cause problems in the airbrush, if its not cleaned thoroughly! I have not found any problems with magic sculp adhering to porcelain. In some situations where the repair needs extra support, or where the break is not clean, I mix it with epoxy glue (we use araldite which is slow setting, or super epoxy, which sets in 10 minutes: I do not use super glue. The main advantage of magic sculp is that the replacement "rings" like porcelain, and if the join is rubbbed down really well, is almost impossible to detect. After that , itis the painting which is important, especially colour matching. We use a primer, called stoving primer filler, an industrial product for the car . It produces a white matt finish, which can be rubbed down if needed. It can also be layered, and either baked at 120Centrigrade of set with the catylist for Rustins Plastic Coating. I sometimes use an infra red lamp to speed up the process. A I got curious, and the next time that I was working with the MagicSculp on a project, I mixed a bit more than I needed, just to experiment on using Armor All. Short form: Does Armor All work as a release agent? NO!!!! crumbled where I applied light pressure. Release agent: Armor All - does NOT work. Release agent: talcum powder/baby powder - works great! Q I am interested in building a marionette that is hand molded and I was wondering just how pliable is this material. A It is only slightly less easy to manipulate than Playdough once the two parts have been kneaded together much as you would two different colors of Playdough. Q What is the drying time. A It actually cures in about 3 hours, less for large accumulations. Q Is it as heavy as pottery clay or is it lightweight. A Not nearly as heavy OR as brittle as pottery clay. Please be prepared to do all your molding before the material cures. For that reason, I recommend the use of an armature around which you can mold the material. Q Have you heard of celluclay? A I use it, but there is absolutely no comparison that can be made between the two materials...apples and oranges. QCould you provide me with some information please. A Please feel free to continue to ask amplifying questions. Once you understand the working properties of MS and get the "feel" of how to properly use it, which is not a chore I assure you, you are going to love it! But, I heartily recommend you peruse the FAQs as just about every question I can think of has already been answered and on file. You will learn techniques as well. A Janice, I have never used MS for the application you have described simply because I do not do mosaics. Sounds really nice! I know Dean would love to have a picture of the finished piece for the web page. As far as application goes, I would suggest running a bead of MS and laying it into the channel. Depending on the width of the channel, roll the diameter of the MS (on a flat surface with your fingers) to just under the width the channel and use a wet finger to smooth the MS in place. It may take a couple of beads to get the grout to the desired contour. If you are the least bit careful, you should not have to worry about the MS getting on the tile. Under no circumstances should you allow the MS to cure on the till as you will pay the devil to get it off. Use a moistened towel to rub off the excess should there even be any. Keep in mind that you can tint the MS with pigmented powders. For a dazzling effect, mix gold artist's powder in. MS will bond VERY well with wood. It won't harm the wood at all. Just keep in mind that you will raise the grain of the wood if you get too much water on it. If I imagine the piece you are creating, the wood serves as a decorative frame that is either flush or slightly raised above the MS. In this case, finish the exterior portion of the wood, but not the side that will bond to the MS. Once, the finish has cured, apply masking tape to protect the finish. Apply the MS. If any slops over onto the tape, no worries. Remove the tape once you are finished. Voila! Perfect finish, perfect MS. I use that technique whenever I want to protect a finish that I need to work around. A I have Grumbacher pigments, but have never tried going to a lighter color. You would have to use pure white to do that. You have to be careful about how much pigment you mix in because you can adversely affect the structural integrity of the final bond. Don't ask me what the limit is because, frankly, I do not know. Mostly, I paint my MS.
A. You have me on this one. I have never tried it or heard of it. once I began paying attention..
Because of my inexperience in working with clay type products , I'm looking for something very "user friendly". Do you think this is a good product to start out with? I will be sculpting bodies and faces. I understand this product doesn't need firing? So that's it? Just sculpt and air dry? If I was doing a larger piece would it be better to use Magic sculpt for the whole figure or should I use something else for the internal shape and just use magic sculpt for the finer details and finishing? A Dear Kay, it is so refreshing to see women entering the hobby. I have some specific recommendations regarding your entry into the hobby. 1. MS cures on its own...rock hard after about 1 week, but decidedly hard after 3 hours. I am working right now on a sculpt of my favorite comic strip characters, Calvin and Hobbs. In this case, I am using Super Sculpey as the substrate and MS for the details. However, I have modified dinosaurs in past, resculpting heads using only MS. In my mind, it depends on how long you expect to work the product. For the dino, I knew I was working only a head and could sculpt it all from MS. In the case of C&H, I wanted to work the whole body at once. Owing to its size, I elected to use Super Sculpey since I could work the material indefinitely. One must bake SS for it to harden. 2. To reassure you, I am not a professional sculptor. Calvin and Hobbs is my very first wire frame sculpt. 3. Resources...whoowee! That is a question. My recommendation is that you take a class. I have several books on anatomy and proportion, which is really what you need. The actual "work" of sculpting is nothing to bother about. Go to your favorite bookstore, B&N, Books a Million, Borders, and go to the art section. That is exactly what I did. You will find a large selection of books on sculpting. I also took a one-hour seminar class from a noted Disney sculptor. I have enough information to do a reasonable job for my first effort. Actually, I am excited like a child over my Hobbs figure! 4. For C&H, I executed some drawings based on the several C&H books I have (I am not an artist, either). I found the poses I wanted, scaled them to the size I needed and used heavy brass wire to make a skeletal frame the same size as the drawings. 5. You will need some basic tools: pliers to bend the brass wire, side cutters to cut the wire, sculpting tools. The latter are similar to ceramic tools, so go to Michael's and raid the tool section. Also, ask your dentist for unusable picks. Once a dentist can no longer use his tools, they are perfect for what you want them for! A set of proportional dividers and calipers are indispensable for scaling the figure. used it as a bonding agent as it is not really designed for that use. shrinkage, if any, should be negligible. A The technique involves proper blending of the two dissimilar surfaces. I use a flat sanding pad with successively smaller grits of sandpaper. While the MS is un-cured, wet the pad with water and "sand" the two surfaces. The solid resin piece will act as a guide for the MS. I have never had a seam problem and I have done some large seam areas. 1. Drill capture holes in the resin, which gives the MS something to hold on to. Don't work the MS too hard. Let the sandpaper do the work for you. other hand, I had a rush job one time and had primer on it after 3 hours. A Here's the solution. On the Styrofoam, punch holes with an awl or nail to give the MS something to grab onto. On the cured MS, rough the cured surface with a motor tool grinding bit to give the MS a toothy surface to hold onto. Finally, to blend the MS, treat the uncured MS as if it were cured polyester putty. Spread some about, then wet sand it with 100 grit sandpaper. It will smooth right out and fill all your seams and low points. Judging from the photo, I would wait until the foam is completely covered to do the wet sanding. I am not sure of how much water the foam will soak up. requirement, just something I do to give the MS a little extra grip. use rods as armatures in my build-ups. Q Is there any way to extend the working time of Magic Sculp? Some chemical you can add to it perhaps? A None that I am aware of. Q I want to do life sized busts and 3 hours is stretching it for me. How about chilling the stuff in the refrigerator before mixing it, would that help? Q Does it work well with a mold? If so, what is the best kind of mold to make, and what's the best procedure to use it? A You need a solid mold. RTV is not very good because it gives too much. sealed plaster mold will do it. Q What kind of paint is the best to use with it (the sculpture will have to endure the elements)? A Whatever paint will hold up to the elements. Once a surface is primed, paint doesn't care what's underneath. I like Plastikote NASCAR brand primer for my models. But, for an outdoor application, I would be tempted to try Dupont URO primer, available at automotive paint supply stores. Q How long do you have to work with it after mixing the equal parts? A About three hours. In large lumps, exothermic reaction will shorten this time. I always work in small amounts. You can always add more MS as the product cures. Q Is the consistency of the material smooth? A Like a baby's behind! Q I ask this because the A-B plumbers epoxy putty had an almost grainy consistency that made fine detail difficult to achieve and it set up really fast. A From a modeler's perspective, that stuff belongs where it was intended. Hope this helps! A I am a bit confused. I routinely smooth uncured MS with a moist finger or fine sable brush. The trick is to use plenty of water and only slight pressure. The water under slight pressure actually does the smoothing for you. If that does not work for you, use wet sandpaper. 3M makes a wet or dry carborundum paper used in the automotive repair industry. Successive grits starting at 180 and proceeding down to 1000 will give you a very smooth, semi-polished finish. Begin sanding at 180 grit and work your way down to 1000 grit. which are available at the automotive supply house. You can acquire these products by calling PPG or Dupont automotive paint stores. These products are used by professionals to attain the glossy finishes on repair and custom jobs. They should work fine on MS.
To recap, I am suggesting a two-step process to polish your work. The first is to get the MS ultra smooth with either water or by successive sanding with 180 to 1000 grit sandpaper. Q Subject: Painting -Can I use enamel paints, such as Testor's, on MS so it can have a glossy look to it? Q I plan to build a 10 foot Tiki statue, and MS sounds perfect. I saw you mention paper mache as an armature choice. I am comfortable with paper mache and feel that I can get the best form with it, but obviously it won't do for outdoors. can i apply the ms directly onto paper mache (over chicken wire?) 2.How about a life size man. How strong of an armature would be necessary for a standing life sized man? 3. l so, I am considering a citronella flame on the Tiki's head. Is the ms flammable when cured? Q Hi, I am an amateur considering buying Magic Sculpt for hobby work. However I like to make small pieces in fine detail (the smallest I've managed so far are roses about 5mm in diameter). Is Magic Sculpt suitable for these purposes? I'd probably need only a very small amount to work with at any one time. Approximately how fast will it dry if I mix, say, two marble-sized globs? I live at the equator but usually like to turn on the air conditioner. the gray background mean that I have to use very thick layers of paints? A Sue Ann, you are going to LOVE Magic Sculp. The smallest piece I have worked with measured around 2mm diameter (detail items). I have rolled it (with a rolling pin) to almost paper thickness. At room temperature, it will set in about three hours, less if you want to stick it in the oven at around 120 degrees. Humidity has no effect on its curing characteristics. MS will harden under water. It will hold whatever shape you desire and painting is a breeze. Prime it with your favorite primer. In the States, I like to use Plastikote Nascar brand primer which goes on very fine. The primer comes in gray and white. able to use the most subtle brush strokes with minimal paint and still achieve complete coverage. chemically-based, one should not use it within the confines of a broom closet. A But it doesn't stick to talcum powder! I recently finished a project that required an 3 x 8 inch sheet of MS. I have lost my pasta roller which would be ideal for the task. Instead, I used wax paper and talc. Use a rolling pin and two parallels. Roll the MS to a rough thickness as if it were pizza crust. You should be able to do this between sheets of wax paper without two much difficulty. If not, add some resin to the mix to stiffen the MS up. The only result is that cure time will increase slightly. After you have it at this "rough" stage, use the parallels to do the fine rolling. The rolling pin rides the parallels with the MS in between. The parallels can be made of any material. Their only purpose is to impart a uniform thickness to the MS. Therefore, the thickness of the parallel should match the thickness to which you want to roll the MS. I used some heavy cardboard (the kind that backs a notepad) as my parallels. If you are interested, the aforementioned project was the interior of the lid to the sarcophagus on Polar Lights' "The Mummy" kit. That effort appears in the latest issue of Hobby Outlook, the official publication of the Hobbytown USA franchise hobby shop chain. Q A friend of mine has been making jewelry out of an oven-hardened sculpting material. I came across a reference to Magic Sculp, and I think it might be something she could use without making the entire kitchen smell of baking plastic. However, all of her work is matte black, and it looks like Magic Sculp is only available in natural gray color. I know she wouldn't want to paint her pieces; that would just be too much work. In a previous question, you said, "MS can be tinted prior to molding but the resultant color is less intense. Addition of too much color may affect the bonding strength." What are your recommendations for dyeing Magic Sculp, especially to a really dark color like black, without ruining its physical properties? A Very good question. Anything you do to color MS will have to be experimental in nature because the original design considerations for the product did not really include its current use by the mass market. Offering the product outside of its original industrial use (which cares not about the color) came as somewhat of an after thought. That being said, I have used a number of other putties (inferior for the purposes we are discussing) that come in a variety of colors. There is one that patches brick, cement, tar, etc, and each comes in the appropriate color. How this is accomplished I do not know. Artist's pigments mix very well with MS. Based on a similar question, I tried this route with good success. I obtained the desired color saturation. Whether this meets your requirements, I cannot say. I suggest you try this route and let us know how the test went. You can use a small amount of MS as a test case and the pigment can be purchased in any art supply house, a 1/2 oz bottle costing around $1-2 depending on the color. Q Hi Chuck! How long does Magic Sculp usually take to cure at room temperature? I usually work at 80 F. Thank you very much. Q Do you know of a releasing agent for Magic Sculp. I plan on turning a hardwood mold for a space ship (creating a negative) on a lathe and pressing Magic Sculp into the mold to create a finished piece. Assuming I don't have any undercuts, can I coat the wood mold with car wax or candle wax (or something?) without Magic Sculp sticking to the mold upon removal? Steve. Q I work for an exhibit company. I am interested in ordering Magic Sculp for a watershed model I am about to sculpt and was wondering how well MS holds up under constant water exposure. A It will hold up just fine. Magic Sculp is sold by one of our distributors under a different name to the marina industry (boat repair) . be durable and what can I paint it with? A Yes, Magic Sculp is very durable, and will take all paints. You might want to use a marina paint for your project. Q I am not a professional sculptor or artist. Although I have had experience with clay and found it was simple to use. Is magic sculp as easy? A Actually, it's Chuck. But, I've been called much worse! One mixes MS. It's a two part epoxy putty, quite malleable. Very easy and predictable to use. Q I want to construct a terrarium for my pet iguana, and I want to make life like artificial rocks. How much would I need to cover 80 square feet? A Depends on the concentration. Are you making individual rocks or a rock-like surface? Either case, that's a lot of MS! Plan on 25 pounds for 80 square feet. What would I use as a sort of base to build up, Styrofoam? plaster cloth (same stuff doctors use for body casts). Q Can it hold up in near 90% humidity for 24 hours a day? Is it toxic after it is cured? may affect the bonding strength. A Once the product is cured it can withstand up to 300 degrees F. In our gallery, you will see that a dragon done with Magic Sculp was for an outside piece. The 100 degrees F-- is for before you mix the product together and your hardener is dry or stiff and needs to soften up before you can mix the two parts together. Once you start to mix the two parts together they begin to cure and that curing will harden the product. The outside heat might make the curing time shorter, but you should be able to learn what you can do in the time frame before it cures. You might also want to wait after mixing to let it stiffen up a little. This is because the heat might make it to soft to work with in the beginning. It is one of those things that has to be played with. If you want to tinker--- Less volume of Hardener to Resin slower the curing time ---more volume of Hardener to Resin faster curing time. Please start off small and let us know if it is working for you. Q Hi there - I collect Art Deco pottery (British) and since most of the pieces are 60 to 75 years old, there are often small chips, etc. For my own collection, I'd like to acquire some damaged pieces that are usually very expensive when whole, fix them, and enjoy them. Would Magic Sculpt do the job? Usually the damage is 1/4 to 1/2" "flake" type chips, or sometimes a corner has been knocked off. Q My name is George and I want to "enhance" an articulated "female military action figure". Since I was not happy with the original job done by the manufacturer, I wanted to add slightly more musculature, enhance the figures femaleness, and then airbrush her with a more "realistic" flesh tone. plastic of the figure without destroying the "Jane". of. You can further improve adhesion by roughing the surface to be modified. For featureless, flat surfaces, I drill capture holes in the substrate. And once added, can the figured then be finished and painted without problems? A It does not crack no matter how thick it is.